Sydney, Australia, 27 October 2018 – Jaguar Land Rover has paid tribute to the 500 Servicemen and women who have captivated the world at the Invictus Games Sydney 2018. The presenting partner awarded two special accolades to outstanding Invictus Games competitors at the Closing Ceremony at Sydney's Qudos Bank Arena. The Games' first tetraplegic competitor George Nepata, from New Zealand was presented with the 'Jaguar Exceptional Performance Award' and Edwin Vermetten of the Netherlands, was awarded the 'Land Rover Above and Beyond Award' for his outstanding gesture of support on the wheelchair tennis court. The international sporting event, which was founded by HRH The Duke of Sussex and presented by Jaguar Land Rover, saw Servicemen and women, both active duty and veteran, from 18 nations join together to compete in 11 medal events, across seven days of inspirational sport. 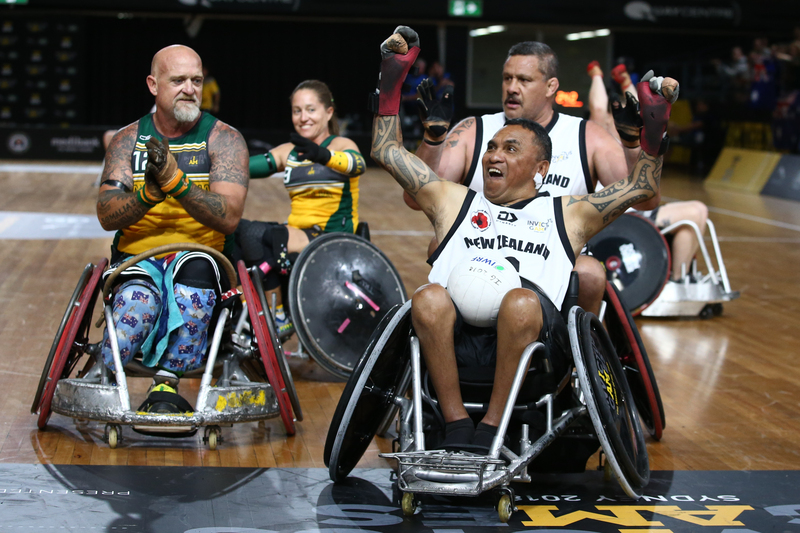 Winner of the 'Jaguar Exceptional Performance Award', New Zealand's George Napata inspired fellow competitors and spectators on the wheelchair rugby court this week. Presented by former Invictus Games competitors Captain Will Reynolds and Curtis McGrath OAM, the award honours a stand-out competitor, who has displayed true determination and dedication to achieve exceptional and inspiring performances throughout the Invictus Games. In a match against Australia, where the New Zealand team was a member down, Nepata pushed through and played the entire game. As the full-time whistle was about to blow on a green and gold win, in a touching gesture by their opponents, the Australian team passed the ball to Nepata to make sure he got across the New Zealand goal line and score a final try. Winner of the 'Land Rover Above and Beyond Award', Edwin Vermetten of The Netherlands, was also given formal recognition on the night. The award seeks to recognise an outstanding individual who has truly demonstrated the spirit of the Invictus Games. In an emotional moment, as Edwin left the stage he was embraced by his doubles partner Paul Guest, whom he had supported on the tennis court earlier in the week. Competing in his third Invictus Games, Edwin showed a true act of sportsmanship on Wednesday, when an overhead helicopter triggered UK competitor Paul Guest's Post Traumatic Stress Disorder, leaving him momentarily unable to take his serve. Edwin quickly recognised Paul's distress – and went 'above and beyond' to support him, comforting him on court and singing Frozen's 'Let it Go' to relieve the stress. The pair went on to win the match, creating a moment which has shared the message of the Invictus Games across the world. Prof. Dr Ralf Speth, Jaguar Land Rover CEO, said: "Having been Presenting Partner of the Invictus Games since they were founded in 2014, everyone at Jaguar Land Rover is hugely proud to be a part of the Invictus Games. The awards highlight two very special competitors, but everyone's heroic efforts in Sydney should also be recognised. On behalf of all our employees, I'd like to congratulate every competitor, for what has been a truly memorable and inspiring week of competition."